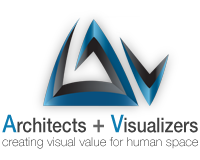 Architects + Visualizers (A+V) is one step beyond “Anaparastasis”, our former CG architectural visualization firm. Transferring into the new scheme the experience and expertise gained between 1995 and 2013, our portfolio includes hundreds of computer visualization projects ranging across all types and scales of architectural, urban, as well as artistic objects, in Greece and abroad. The majority of our work involves mostly large-scale projects commissioned in Greece by artists, architects, developers, construction groups, and government agencies. Dipl. Architect Engineer, National Technical University of Athens (NTUA), PhD in Computer-Aided Design, NTUA. Lefteris Virirakis is a CAD professional and researcher. His professional activity includes mathematical – geometrical analysis of special design projects, development of project-specific CAD applications, as well as 3D rendering and animation of architectural, industrial and artistic projects. He also carries out research in AI design methods, specializing in genetic algorithms (GA) and related CAD applications. His research activities include development of AI-GA computer languages, as well as contributions to the field of Integrated Building. Dipl. Architect Engineer, National Technical University of Athens (NTUA). Joakim Piniros is a CAD professional and design researcher. His professional activity includes architectural design, technical solutions and consultancy on special design projects, 3D modelling and CG visualization (3D rendering – animation – VR) of architectural, industrial and artistic design projects, architectural CAD support, as well as development of architectural and educational multimedia applications. In his research capacity he has contributed to the fields of Integrated Building and Architectural Sustainability.